Everybody knows the bright red leaves of the flamingo flower. With its thick green leaves and the beautiful red spathaceous bracts, she emphasizes the features in your home or at the office. 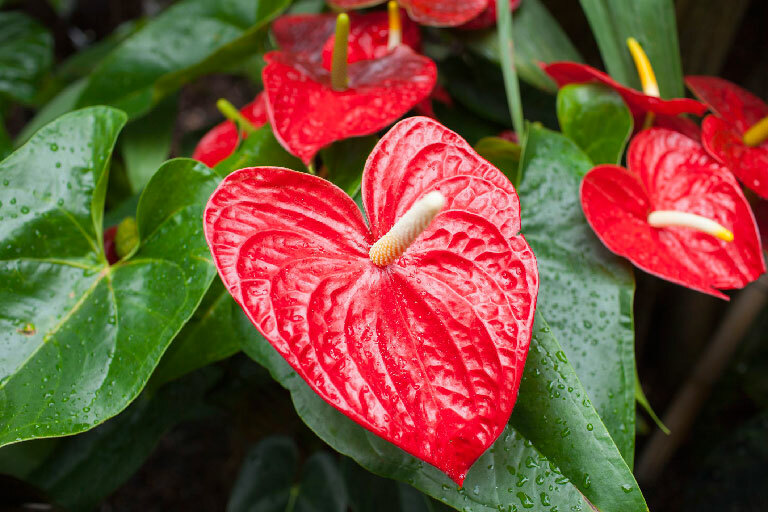 How to care for anthurium – the name of the originally tropical plant – is explained in our special care instruction for the flamingo flower. Generally, the flamingo flower is plainly called anthurium. Belonging to the araceae, she is part of a species-rich family. Among the hundreds of types, especially two are popular for in-house keeping: The great and the small flamingo flower. As an evergreen, persevering plant, she is an asset for every room – especially if she develops her beautiful spathaceous bracts. These bright red leaves are often wrongly referred to as blossoms, however every plant enthusiast enjoys her look. We describe in detail the care and multiplication of the tailflower. With good care, which includes placement, soil condition and watering, the flamingo flower will thrive for many years. 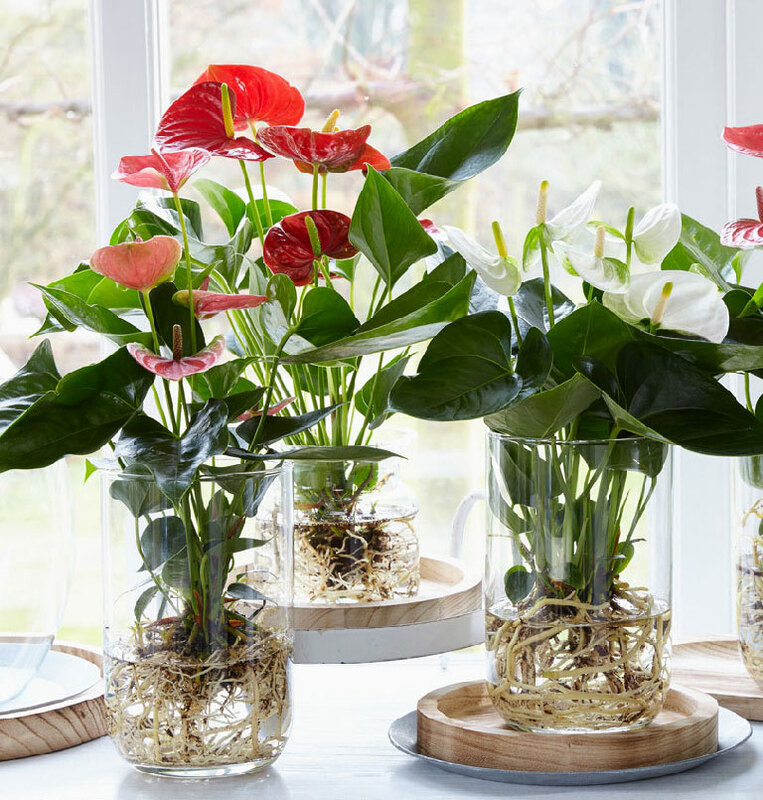 The experienced plant lover will be delighted by the multiplication of the anthurium. Therefore, from the beginning it is important to create optimal conditions starting with the placement inside. Her original habitat are the tropes. This makes finding a suitable spot not easier. Characteristic for the tropes are thick plants and an almost closed leaf canopy. Therefore, she also does not like direct sunlight in the house, however, she prefers the light. It is necessary to find a place which is semi-shade. At the same time, she cannot tolerate neither draft nor dry heating air. When one or both components occur, she will visibly suffer and possibly waste away. Radiating heaters should therefore not be in close proximity. Overall, the room temperature should be between 18 and 25°C ( 65℉- 77℉ ). The anthurium can be placed in the bed room as most people enjoy cooler temperatures in their bed rooms compared to their other rooms. Also, the bath room would be suitable. The humidity is good for the flamingo flower. This tropical plant enjoys a harmonic climate. This means that she should also not even in small rooms be surrounded by less than 15°C ( 60℉ ). Unfortunately, this also applies to the summer months. She should not be placed in the garden or on the patio. In any case, please avoid direct sunlight! In any case, the soil should be light, loose, and permeable. A very permeable substrate is suitable, such as which is used for orchids. Also, small balls of Styrofoam ensure that the soil stays permeable for air and water. You can already guess: The flamingo flower must not have waterlogging. 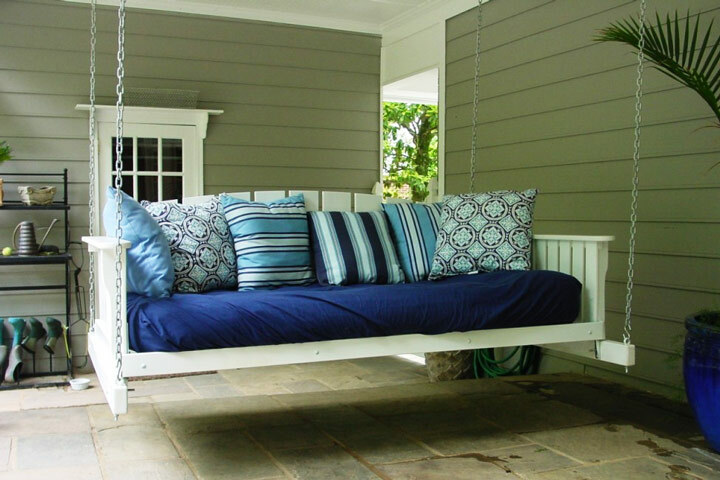 Even high quality garden or flower soil could be too heavy, because it retains moisture for too long. It should also be without a too high chalk content. Originally an epiphyte, this plant prefers nutrient-poor substrates. For example, in the rain forest she looks for a place between shrubs on the rain forest’s ground. Tip: If the flamingo flower regularly develops blossoms, she has got the right placement and soil. But if she does not produce any of the bright red spathaceous leaves, the place is too dark and should be changed. The flamingo flower’s base is a thick rootstock. From here the plant is supplied not only with water, but also with nutrients. Therefore, you will endlessly look for a big root bale at the anthurium. At the same time this means that she must not dry out. The few, thin roots can only save a little moisture, creating the reason why a harmonic ratio of high humidity and watering is ideal. The plant shows a lack of water with shedding of the blossoms. Therefore, she should be watered once or twice a week. Ideal would be rainwater or stale water having been in the watering can for at least two days. During the winter months, she needs a little less water. 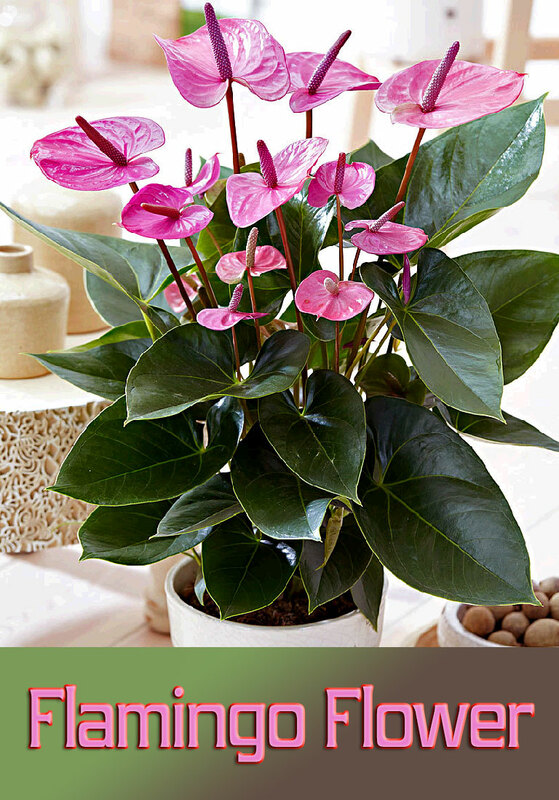 To bring the anthurium to blossom, she needs to only be fertilized in low concentration. Use a good orchid fertilizer. Orchids and flamingo flowers are from the same habitat and thrive as epiphyte in a similar manner. Due to this a fertilizer with similar nutrients should be used. During winter the surface of the substrate may dry out from time to time. But more missing moisture should not be tested. Tap water can lead to a permanent calcification of the soil. Therefore, it is advisable to repot annually. The substrate needs to be completely renewed to remove any remaining chalk. In the long run, collecting chalk can hurt the delicate roots. Even flat tap water still contains a small amount of chalk. the flamingo flower needs to be repotted annually! In this case, a larger pot for re-potting is not necessary. It is only about the exchange of the calcified substrate. If rainwater is being used for watering, re-potting might not be necessary. The correct time for re-potting is during spring. In case many long roots were developed, massaging of the base is necessary to carefully loosen the roots. Then, free the root system from as much old soil as possible. The pot should be prepared with 2/3 of substrate filling. Then the plant will be inserted and more substrate will be filled in and pressed. Afterwards, water well and let excess water drip off. Firstly, only the strong sprouts will be chosen. Meaning the ones which have small knots in the lower part. These knots are root attempts, which are not yet developed but are suited well for multiplication. Cut the sprout diagonally with a sharp knife under the root attempt. Afterwards put the cutting in a glass with flat water or rainwater. 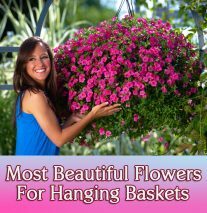 Choose a bright place which treats the plant with a temperature of 20-25°C (68℉ – 77℉ ). Now, it can take a couple of weeks until the first roots develop. Depending on the quality of the water, a water exchange could be necessary. When changing the water, please pay attention to using nutrient-rich rainwater or stale tap water. When long and strong roots have finally developed, the new flamingo flower may be planted. Rather wait a few days because too short roots are not sufficiently supplied with nutrients and water, leading to the death of the plant. With good care, the anthurium will grow and flourish. At the right time during spring, multiplication can proceed. This is preferably done through separation. The exchange of the substrate can be done at the same time. For separation of the plant, lift the plant from the pot and cut it with a sharp knife in two or more parts. Pay close attention that every part contains sufficient fiber root and a small rootstock. The pot should already contain a portion of the substrate, then the cut-off parts of the plants will be put in each pot respectively. Subsequently, the pot will be filled with additional substrate and generously watered. Finally, the draining of the water is important, so that the roots do not stand in water. The multiplication through cuttings requires mainly one thing: patience. But a true plant enthusiast does not lose the joy of multiplication and will try all possible options, including the multiplication by cutting which can take quite a long time. The multiplication with seeds is a gamble but can work well. Requirement is the pollination of the blossom. When this happens, small, transparent fruit develop which can be used for seeding. You should not miss this point in time because the seeds of the flamingo flower are time-limited germinable and need to be put in soil as fast as possible. Open the little berries and take out the seeds. Afterwards, the pulp needs to be washed off as it obstructs germination of the seeds. Please note: The seeds of the anthurium are light-dependent germinators, so when seeding they should barely be covered with substrate or soil. The seeds are laid out in a propagator tray filled with a substrate consisting of turf or sand. Before laying out the surface needs to be pressed to avoid the sinking of the seeds in the sand. Instead of using a propagation tray, you may also use a planting pot which will afterwards be covered with plastic foil or a glass. After the seeds are placed on the cultivation soil, the soil needs to be kept moist with help of a water sprayer. The pot should be placed in a bright spot with temperatures of about 20-25°C. Depending on the conditions, the propagation tray needs to be aired every two to three days and sprayed with water. The germination of the seeds happens after ten to twelve days. As soon as the seedlings are big enough to take them out with the fingers, you can thin them out. The root should have an appropriate size. Ideal for the start is cultivation soil which is equipped with the right nutrients to develop the small seedlings into beautiful flamingo flowers. Compared to other domestic plants, caring for the flamingo flower can be challenging at times. The right ratio of humidity and watering is not always easy. On the one hand, the roots should not be watered too much. But on the other hand, the plants desire high humidity. If irrigation is too high, the roots tend to rot, then fast action is needed to prevent the flamingo flower from death. First signs of too much water are yellowed leaves and the premature dying of the wonderful red blossoms. She will also become vulnerable for pest infestation such as mites. In most cases, reason for this is over-watering. In case of a pest infestation, such as spider mites, red spider mites, or mildew, everything needs to be handled with care. 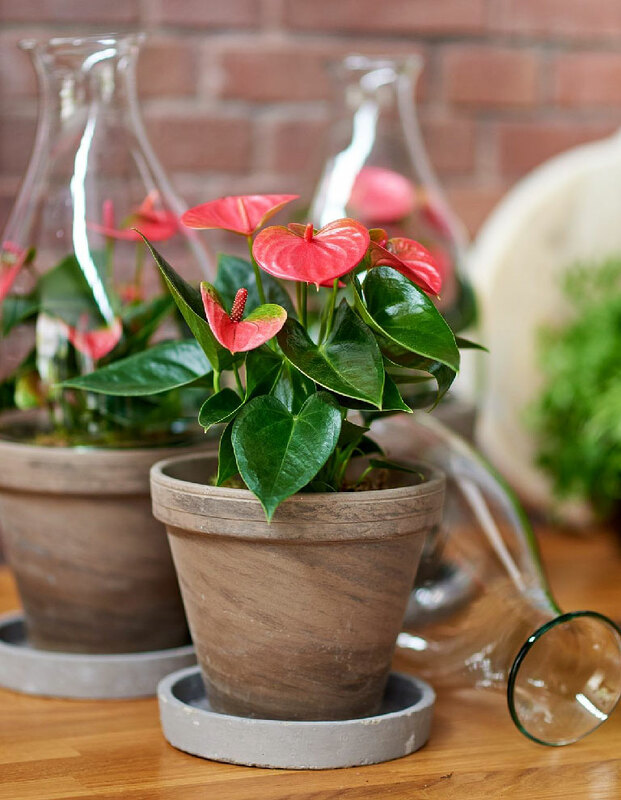 Anthurium reacts very sensitively to chemical treatment. Either you should carefully use home remedies, such as soap solution or the plants will get a shower, in which they will be held upside down. With this treatment, the parasites should get showered off without the use of pesticides. In case it should be necessary anyway, a trial run on one or two leaves is highly recommended. If the flamingo flower reacts positively, you may proceed and continue with treating the entire plant with pesticide.